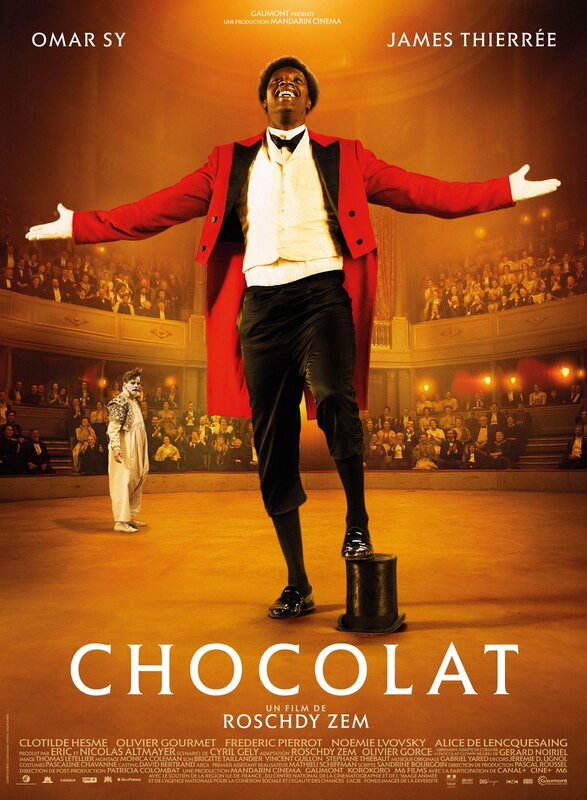 Monsieur Chocolat is one of those typical period dramas that tells a story of days of human degradation gone by more for the sake of the present day than for the desire to accurately reflect the times depicted. Though the director and writers proclaimed their intention of re-introducing a once famous French artist who by the dawn of the 21st Century had slipped into obscurity for a contemporary audience, the issues of race, though certainly a factor of Chocolat's life, are addressed far more strongly than they most likely were back in the days. Of course, Chocolat's entire career was based around his otherness and influenced more by the ignorant cultural notions of white audiences than they were by reality, but that didn't stop him from becoming one of the top theatrical artists of his day. And he was known to be proud of that achievement, even though much of his acts involved getting his arse kicked by a white clown. But the blatant, painful melodrama of his life suggested by Monsieur Chocolat is more of an attempt to remind modern audiences of the insanity and humiliation on which his career was based rather than on actually reported events. Not to mention Chocolat's private demons involving women, booze, drugs and gambling, which add further obstacles to his career beyond simply attempting to add diversity to his stage acts. Basically, by adding all these other troubles, the writers make it clear that Chocolat is an artist like any other, dealing with the same pitfalls of fame that other artists experienced. It makes for rather generic situations beyond the ever degrading scenes of racial subjugation and does little to push Monsieur Chocolat above the myriad of similar films involving struggling performers of any ilk. The performances, less so. Omar Sy may actually have hit a career high note in this one, delivering what certainly can be called his most convincing performance since Intouchables. He moves from merry clown entertaining women and children to broken, down-on-his-luck artist plagued by rampant racism seemingly effortlessly. Not to mention he and his co-star James Thierrée are equally matched, with the latter playing a perfect counterpart as the stage obsessed but otherwise grumpy and serious clown Footit, a total opposite to the light hearted Chocolat in many other respects beyond race. The duo makes for a strikingly different pair of personalities you could hardly imagine sharing the circus, though the ultimate break-up feels an inevitable event from the get-go. The circumstances involving their separation were not as 'black and white' as this film suggests though. Again, Monsieur Chocolat feels the need for distorting the truth to underscore the malign racism of the era. That message is well received, but the historical character of Chocolat is not aided by hammering home the message so harshly. However, thanks to this film, he is also not forgotten, so the makers succeeded in that regard as well.